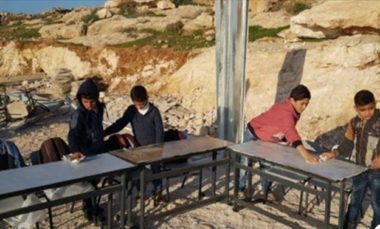 Israeli soldiers invaded, on Monday at dawn, the Tahadi 13 smalls school, near the entrance of the Sammoa’ town, south of the southern West Bank city of Hebron, and dismantled it. The schools, which provides education to boys and girls, from kindergarten up to the sixth grade. The cost of building the school arrived to 40.000 Euros, and provided education to 35 children from Seemia and Deir Shams villages. It consisted of several tens, desks and chairs, provided by the Palestinian Ministry of Higher Education, and local donors. It is worth mentioning that the soldiers dismantled and demolished the school several times before, including last Wednesday, and the soldiers confiscated all of its properties. The head of the Ministry of Education, southern Hebron office, Khaled Abu Sharar, visited the school, and told WAFA Palestinian News Agency that took the tents, desks, chairs and other properties, before dismantling it. Abu Sharar visited the school, and told WAFA that the ministry and locals are rebuilding the school, despite Israel’s constant violations, destruction and the ongoing attempts to force the Palestinian out, managed to install three tents at dawn, to ensure the continuation of the educational process. The official also stated that the Education Ministry will not just step aside and watch the constant Israeli violations against the school and the basic human rights of the students, and added that every child has the right to attend a school in their communities.